You are here: American University Media Relations News Do Witchcraft Beliefs Halt Economic Progress? Do Witchcraft Beliefs Halt Economic Progress? The negative association is highly significant and robust to the inclusion of a wide range of individual socio-demographic characteristics, measures of regional geography, economic development, conflict, etc. It’s long been argued that witchcraft beliefs impede economic progress and disrupt social relations, and Gershman’s statistical analysis supports that theory. From a policy perspective, Gershman’s results emphasize the importance of accounting for local culture when undertaking development projects, especially those that require communal effort and cooperation. Gershman and other social scientists believe that education can help foster improved trust and decrease the prevalence of witchcraft beliefs. “Education may contribute to an environment with higher levels of trust and mutual assistance, insofar as it helps to promote a rational worldview and reduce the attribution of any misfortune in life to the supernatural evil forces of other people in the community,” Gershman said. Many anthropological case studies document how fears of witchcraft attacks and accusations erode trust and cooperation in African societies. Evidence on the corrosive effects of witchcraft beliefs comes from fieldwork conducted in Tanzania, South Africa, Cameroon, Namibia, Mozambique, Zambia, and other countries, where witchcraft-related fears manifest themselves in diminished cooperation, breakdown of mutual assistance networks, avoidance of joint projects, mistrust in community members, and general decline in social interactions. Gershman’s analysis of the Pew data documents that a systematic pattern of this sort exists in regions in 19 countries of sub-Saharan Africa. The relationship between witchcraft beliefs, trust and erosion of social capital extends to many places beyond sub-Saharan Africa. Using additional survey data from 23 nations (including those in Asia, Europe, North Africa, and the Middle East), Gershman compiled a broader country-level dataset on witchcraft beliefs. 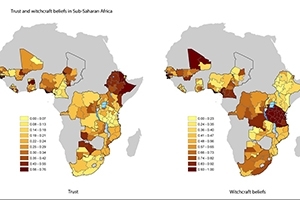 His analysis also reveals a negative association between witchcraft beliefs and generalized trust in the cross-section of countries, similar to that observed for African regions. Witchcraft may be alone among supernatural beliefs for having a negative correlation to trust. Beliefs in heaven, hell, reincarnation, angels, miracles, and evil spirits have no relationship to trust, Gershman found. It’s difficult to understand why witchcraft beliefs persist and what purpose they serve. Noted economist and jurist Richard A. Posner theorizes that witchcraft accusations against wealthy community members force them to share their surplus, so witchcraft beliefs promote mutual insurance in societies that lack conventional methods for redistributing resources. Other theories suggest the belief in witchcraft reduces social tensions or de-escalates conflicts; yet that explanation doesn’t square with the fact that witchcraft accusations sometimes lead to cascades of ritual killings. “A belief in witchcraft may be a way to keep order in society, but it’s definitely not the best way,” Gershman said. “It forces one to conform to local norms because any deviation may lead to an accusation.” This type of forced conformity under fear leads to immobility and interferes with wealth accumulation and adoption of innovations. The consequences of such behaviors likely exceed any potential benefits, Gershman added. Gershman, who studies the social costs and benefits of culture, has also published research on the “evil eye,” a cultural belief that a person’s envious glance leads to property destruction. The evil eye belief is also harmful to economic progress but in a different way, Gershman said. “Witchcraft beliefs are likely to erode trust and cooperation due to fears of witchcraft attacks and accusations. The evil eye leads to underinvestment and other forms of unproductive behavior due to the fear of destructive envy, where envy is likely to manifest in destruction and vandalism involving those who own wealth,” Gershman said. “Witchcraft beliefs and the erosion of social capital: Evidence from Sub-Saharan Africa and beyond,” is published in the May issue of Journal of Development Economics and can be found online here.